There are 15 posts filed in Bolivia (this is page 1 of 1). 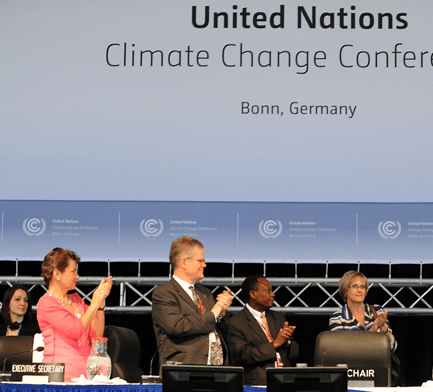 REDD at COP18, Doha: At a crossroads or stuck in neoliberalism’s dead end? REDD negotiations came to a grinding halt at the end of the first week of COP18 in Doha when Brazil and Norway disagreed over the verification of emission reductions from forests. Bolivia’s Joint Mitigation and Adaptation Mechanism: An alternative to REDD? In August 2012, the Bolivian government presented a proposal to the UNFCCC titled “Proposal for the Development of the Joint Mitigation and Adaptation Mechanism for the Integral and Sustainable Management of Forests”. Can REDD save the Amazon? Two pieces of depressing news from the Amazon. First, the price of gold has increased, leading to increased mining and increased deforestation. Second, Brazil is planning to invest US$120 billion in large-scale infrastructure projects in the Amazon region. What if the Amazon tips from a carbon sink to a source? In the past few years, the Amazon has faced two “one in a century” droughts. Last year’s drought covered a larger area of the Amazon and was even more severe than the 2005 drought. In both years huge amounts of carbon was released to the atmosphere as trees died. During these severe droughts, the Amazon turned from a carbon sink to a major carbon source. REDD in Cancun, part 1: What happened to Bolivia’s text in the AWG-LCA? So far, the REDD negotiations in the Ad-hoc Working Group on Long-term Cooperative Action (AWG-LCA) in Cancun seem to have little to do with either cooperation or action. Yesterday, Bolivia’s Ambassador Pablo Solón said that the latest text “is imbalanced, and excludes the proposals of Bolivia and many other developing nations”. As the UN’s climate negotiations resumed yesterday in Bonn, Germany, the Ecosystems Climate Alliance released a statement calling for a new UN forest definition – one that makes clear the difference between native forests and monoculture plantations. A second Ecosystems Climate Alliance press statement released today outlines “outstanding REDD issues” to be addressed in Bonn.